The four-project cluster, totalling 4.8GW, was approved by the UK government in 2015, having originally been developed at 7.2GW. Forewind originally comprised of four members: Innogy — part of the RWE group, Statoil, Statkraft and SSE. Norwegian utility Statkfraft sold its stake in March 2017, having already signalled its intention to divest from offshore wind activities, claiming the industry was "too capital intensive". The three remaining members have now come to an agreement on how to proceed with the zone, 130km off the UK's east coast. 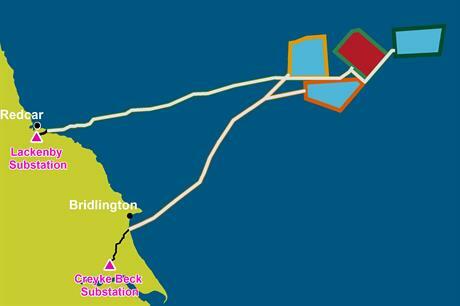 Statoil and SSE will form a 50-50 joint venture to take on three of the 1.2GW projects in the zone: Creyke Beck A, Creyke Beck B and Teesside A.
Innogy will go it alone, taking on the Teesside B site in the centre of the cluster. "Dogger Bank represents a unique opportunity for the UK to develop secure, sustainable and cost-competitive energy from its world-class wind resource," Statoil executive vice president for New Energy Solutions, Irene Rummelhoff said. The split is similar to that seen at the East Anglia Zone, also off the UK's east coast. This had been developed in partnership between ScottishPower Renewables and Vattenfall. However, once the projects had cleared the permitting stage, the two developers split the zone, and the projects, to continue the sites alone.